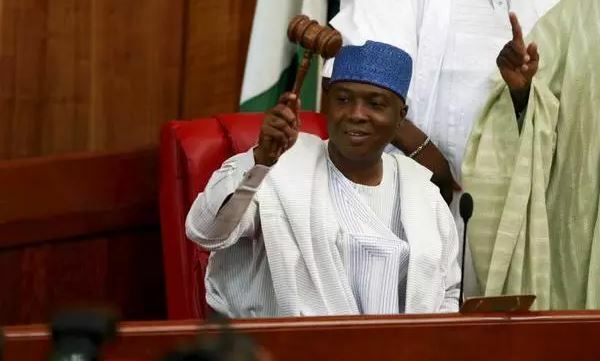 Senate President, Abubakar Bukola Saraki, on Saturday declared that time will determine his position in the affairs of the All Progressives Congress (APC). Saraki noted that although he does not want to dwell on the issue of whether he is still wanted in APC or not, he said "time will tell what happens." The Senate President made the declaration at a farewell dinner for delegates of the International Press Institute (IPI) World Congress which he hosted in Abuja. The Senate President was responding to a comment by the Chairman, Daily Trust Newspapers, Kabiru Yusuf, who praised him for going to Saudi Arabia to perform the Lesser Hajj, went to Russia where he addressed the Russian parliament and returned home to attend the APC convention "a party to which he belongs but which increasingly does not belong to him." Saraki appeared to have been taken aback by the remark that he "belongs to APC but increasingly the party does not belong to him." He said, "Kabiru made a comment and said that he welcomes me as a member of the party and further said he is not sure if the party welcomes me as much as I welcome them. "I am not going to comment on that because I will be here all night commenting on that. I won't like to be the front page story but time will tell on that. "Already, based on this comment, I know most newspapers headline would be time will tell. So I won't be surprised if I check This Day newspapers and I see: The Senate President says time will tell." On the IPI World Congress in Africa, Saraki expressed hope that in the near future Africa will receive nod to host it again. He also expressed pleasure that the world's best journalists, editors and media executives converged in Nigeria to explore the theme � 'Why Good Journalism Matters: Quality Media For Strong Societies�. Saraki noted that he had no doubt, from the engaging sessions and enriching discussions over the last couple of days, many strategies should have been formulated that will take the practice of journalism to new heights around the world. He welcomed IPI officials to Nigeria and called for more regular visits, and indeed annual congresses, in Africa. "This, I believe, will make for better understanding of Nigerians and Africans in the eyes of the international media. When international journalists themselves come in our midst and get the right position about Africa, the image of our continent will start to improve in the eyes of the world out there," Saraki said. The visiting journalists, he said, will agree with him that "negative stereotypes of the so-called 'dark continent' have been bandied about for too long. "This has had an unfortunate effect on the development of Africa, as well as the sense of pride and dignity of young Africans down the ages." The Senate President said that they know that "these negative notions of Africa are largely misconceptions." According to him, "in those cases where there may have been some truth in them, what we also know is that culture is not static. Some things that may have been true of Nigeria in the 1930s are no longer the case in the Nigeria of today. We can say much the same about America in many respects, or indeed of any place else. "Culture is dynamic and refreshes itself; it evolves. It would therefore be appropriate for the larger world�s view of Africa to move apace, in line with the changing times. The media is key to achieving this." He added that "how we begin to redress the balance goes to the heart of responsible journalism itself. "It starts with quality, accurate and objective reporting � the hallmarks of good journalism. Objectivity and impartiality, those time-honoured principles of responsible journalism, cannot be over-emphasised," he said. Saraki noted that "as Nigeria heads into the 2019 election year, we plead with the press � national and international - to maintain objectivity at all times in their reporting." "I say this because there can be no democracy without credible elections. If we get the election right, then we have a better chance of making a stronger society. "We are living in times that call on the press to strive, more than ever, to defend freedoms. Events all over the world attest to the urgency of this. "The media must be a defender of values; it must stand for rights, for openness - for the remaking of a world where the powerful will not oppress the weak." The Senate President I noted that �in the era of Fake News, especially with the fragmentation of the social contract as we are witnessing all over the world today, it is clear to me that the media cannot afford to be complacent." The media, he insisted, "cannot allow itself to be complicit" saying "when false claims are made, which could heat up the polity - or set different groups off against one another - it behoves the media to expose these by countering with verifiable facts.� He recognised that the media is facing its own challenges, due in part to the internet and the rise of social media. "So also, are the modes of relaying the news to an audience whose preference for receiving mass communication is also changing with each passing day. "The media must adapt for this rapidly changing environment, in order that the journalist may fulfill his or her role, in the Lincolnian tradition, as a defender of democracy." Saraki who said that more than ever, the media must be proactive in defending the people's right to know added that "in spite of the obstacles, the press must press on, because it is its responsibility to help society know itself better." He said that the media is a galvanising artery that holds the world together, a collective mirror to global conscience. �We salute you, and thank you for your steadfastness and courage, despite the privations suffered in the journalist's pursuit of the people's right to know,� he said. He assured of the continued support of the Senate, and indeed the entire 8th National Assembly of the Federal Republic of Nigeria, to ensuring a free and vibrant press capable of playing its part in strengthening democratic norms. "We stand committed to upholding press freedom, and to come to the aid of journalists whenever the need arises. "Our doors are open and will remain open to ideas, strategies and policies for improving the practice of journalism in Nigeria and the condition of the journalists themselves - in line with global standards," he said.